One of my college roommates is due with her first baby very, very soon (yay!) and the other day she texted me and another friend to ask about what we would put in a “postpartum survival kit”. I thought that was a great question, so I’m writing down our responses here in case it helps someone else! 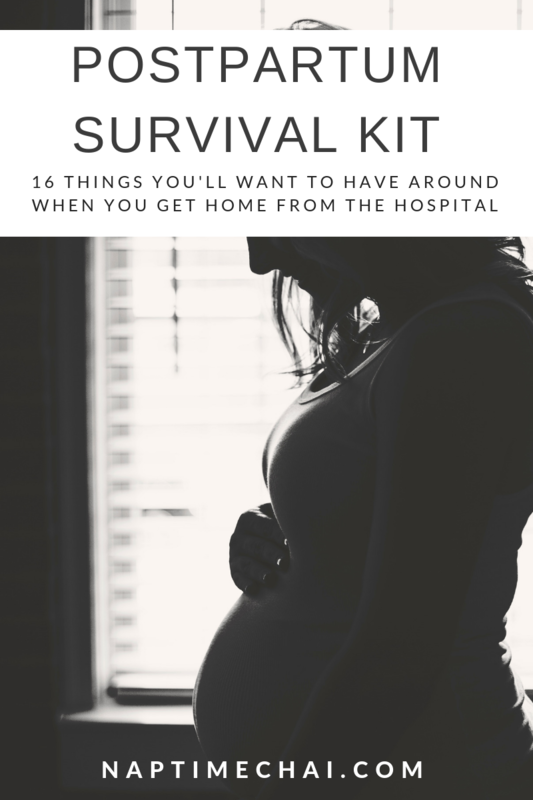 This is a list of things I’d either make sure I have in my own home for when I get back from the hospital with a new little one, or maybe things to put in a gift basket for a friend who is expecting a baby! Snacks – a lot of protein bars, nuts, fruit, and things you can munch on throughout the day. I mean, super healthy food is always good, too, but you’ll really want to have things that you can conveniently eat while nursing or lounging that you don’t need to make in the kitchen. Nursing bras – essential if you plan on leaving your house, ever! Or even if you don’t and you want some support under your lounging clothes. Nursing tank tops – some people prefer tanks to nursing bras. I used a combination of both! Sweatpants – make sure you have a pair that will fit! Any loose maternity sweats or larger ‘regular sized’ sweats will work. Basically, don’t plan on being back in your pre-baby comfy pajama pants immediately, and make sure you have a pair that either sit low, or can be rolled down to be below any potential c-section incision/stitches. Nursing pads – either reusable or disposable! I wish I had used these more because I was lazy about putting them in my bra and basically had milk stains on everything for months and months. Dry shampoo – if you aren’t already using this stuff, now’s the time to start! Bathrobe – you can bring this (and most of this other stuff, actually) to the hospital so that if you have guests, you can nurse easily, and feel a little less grungy. I never thought this was necessary, but the third time around, I’m doing it! Plus, then you can use it at home for guests, as well, those first few days when family is coming over and you don’t feel like getting dressed in ‘real’ clothes..
Pads (of the feminine hygiene variety) – you will bleed a lot and you want to be prepared right away so you aren’t making last minute trips to the pharmacy! Eye drops (or glasses) – when you’re breastfeeding, prepared to be a bit dehydrated! You’ll want your glasses on hand or eye drops for your eyes if you wear contacts. Lotion – I loved using my belly lotion even after I gave birth (mainly because it smells so awesome and feels great!). Same reason as above, everything dries out after the entire labor/delivery ordeal and with breastfeeding. Chapstick – I mean, this is always an essential, right?! If you don’t put any other makeup on for a while post-baby, you’ll at least want some chapstick to help with dry lips! Face wipes – Let’s just be honest, I didn’t always have the energy or motivation to wash my face in the postpartum phase. (Or in life in general, if we’re being honest!) Keep some wipes on hand even if you aren’t removing makeup, and you can freshen up with minimal effort. Prenatal vitamins – keep taking these for as long as you’re breastfeeding! They aren’t just for prenatal purposes. Pain medications – for when you wean off any prescription meds they give you at the hospital. Another note on things you actually need to have at home those first few days… you really don’t need much. I feel like some ladies prepare like it’s going to be the apocalypse, and maybe that’s fine for them, but for me, it seems stressful. You don’t need tons of frozen meals, you don’t need a month’s worth of groceries, you don’t need tons of extra toiletries… what you need is Amazon Prime or a relative / significant other / friend who doesn’t mind grabbing something if you decide you need it! I mean, it might be good to have some lasagnas in your freezer, but people will probably bring food to you those first few weeks, hopefully. And we just ordered a lot of takeout when my girls were born. Basically, if you’re feeling exhausted preparing, just know that you will be able to manage with minimal prep. However, if it makes you feel better to plan ahead, by all means, go for it! What am I forgetting? It’s been a few years since I’ve brought a newborn home!